Here’s one more reason marketers need to focus on positive recommendations and ratings online for their brand’s products. 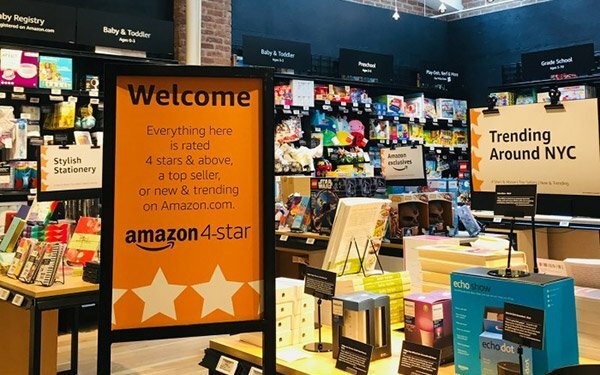 Amazon is opening a New York retail store to sell high-rated products — and it’s basing the availability in the store on online ratings and reviews. It’s no longer about rankings online, using recommendations to earn a top position on the page in online search results. Rather, it's another way to bring that product into physical stores. Today, Amazon will open a new brick-and-mortar store in the SoHo neighborhood of New York that features a selection of goods curated, in part, by the online shopping habits of local customers. Items include only those ranked four stars or above. The company, which announced the opening in a blog post on Wednesday, began with some of the most popular categories on Amazon.com, like devices, consumer electronics, kitchen, home, toys, books, and games. “Today, the average rating of all the products in Amazon 4-star is 4.4 stars, and collectively, the products in store have earned more than 1.8 million 5-star customer reviews,” the company noted in a blog post. Prime members pay the Amazon.com price in the store. Amazon also began focusing more on visual tools for its marketplace through its Rekognition platform. It offers a suite of image recognition tools, including object identification that enables visual search. The application programming interface (API) for the tool helps Pinterest interpret text within images. Amazon’s visual search technology also powers Snapchat’s visual search tool, according to eMarketer.